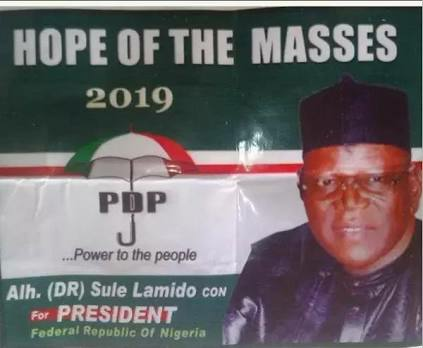 The 2019 presidential posters of a former governor of Jigawa State, Alhaji Sule Lamido, yesterday surfaced at the secretariat of Peoples Democratic Party (PDP) in Lagos State. The posters bearing Lamido’s different pictures were pasted at strategic areas of the secretariat right from the entrance during yesterday’s general assembly of the party. Daily Trust observed that some members of the party were also wearing branded T-shirts with inscription ‘Lamido for 2019’. The former Jigawa governor is believed to be eyeing the 2019 ticket of the PDP. He was quoted in January to have said that if it was God’s wish to make him the president of the country, no individual or politician could stop him. He spoke during a botched rally planned for him by a group in Jigawa State calling on him to vie for the PDP ticket in 2019. It was, however, learnt that the Lamido 2019 presidency project was being championed by some northerners who were PDP members in Lagos State. 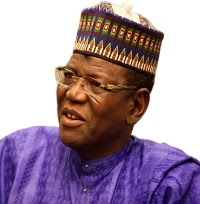 One of them, Hassan Mohammed, an official of the party at Ikeja Ward I, said they were calling on Lamido to contest because they believed he had the capacity to rule the country. We have seen his performance as governor of Jigawa State for eight years. He is indeed a man of the people and he has that pedigree and reputation to fly the party’s flag come 2019, Mohammed said. However, the Lagos PDP distanced itself from the posters, saying it had not endorsed any candidate for 2019. The party’s spokesman, Taofik Gani, made the clarification in an interview with our correspondent.